Why Argentine Ants Invade Houses In Southern California? How To Protect Your Home Without Damaging Your Body. How To Fight These 6-Legged Warriors In Your Backyard. How Are Argentine Ants Like The "Borg" In Star Trek? Will Argentine Ants Try To Assimilate You And Your Home? Is It Futile To Resist Their Persistent Assimilation? See Full Page Of Argentine Ants: HTML Body Background Image. Argentine Ant (Iridomyrmex humilis = Linepithema humile). 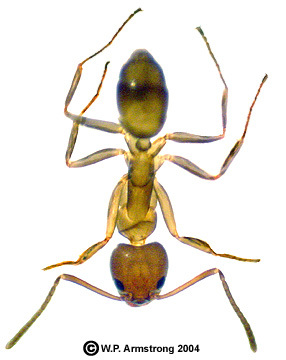 The most common ant in southern California is the Argentine ant (Iridomyrmex humilis). According to Wild (2004), this species was originally described in the genus Linepithema by Mayr in 1866; therefore, the proper binomial should be Linepithema humile. It is a small, dark-colored ant about 3 mm (1/8 inch) long that invades homes in search of food and water. They are especially fond of sweets, but will feed on practically any food. They love the yolks of hard boiled eggs and carry minute yellow clumps of yolk back to their nest in endless ant columns. These ants are extremely well adapted to urbanized areas of the United States with mild climates and well-watered gardens. They pose a serious threat to native wildlife by upsetting delicate food webs. They are especially formidable due to their aggressive behavior and the enormous size of their colonies which can literally "team up" with other colonies. (transparent), yellowish-brown legs and body. Without backlighting the ants are darker as in following 2 images. Argentine ant trail on my backyard patio and on a hard-boiled egg yolk. If you live in southern California, you probably have seen endless single file columns of uninvited six-legged guests walking through your home. They follow a pre-marked pheromone "scent" trail initially laid down by scouts who were searching for goodies in your pantry. Although they prefer the outdoor life style, they primarily enter houses for food and water. They are fond of sweets, tuna, syrups (even cough syrup), juices, eggs, dead spiders and rodents, vomit, feces and just about any other organic matter they can find. They are essentially scavengers and they play a valuable role in the natural ecosystem--but preferably in Argentina. In hot, dry weather they often search your home for water, including bathroom faucets and drains. I once followed an ant safari into my bathroom where they were neatly stacking their precious cargo of tiny eggs inside my toilet tank. They also relish the "honeydew" secretion of aphids, and protect their aphid friends from natural predators. In the fall months as the nights get chilly, they once again seek the warmth and shelter of your cozy home. The first Argentine ants set foot on U.S. soils in the late 1890's, as coffee ships from Brazil unloaded their cargo in New Orleans. Being prolific breeders and constantly on the go, they moved across the southern half of the United States. A single colony may contain 10,000 female workers, and there may be hundreds of colonies around your home; the total number of ants could easily reach a million. Although they cannot sting, they can bite; however, they are only about 3 mm long and their tiny mandibles are too small to hurt humans. But, in the world of insects, these ants are truly a living terror. They are very aggressive and readily overtake other ant species, even ants that are much larger and with powerful stings. Argentine ants are relentless and simply outnumber their adversaries until the enemy colony is destroyed. They even attack paper wasp nests under the eaves of a house, forcing the huge wasps to flee their nests in terror. Even nests of large carpenter bees are no match for these relentless ants. A "killer bee" nest probably could not withstand an invasion of Argentine ants. They also will attack bird nests, driving off the mother bird and killing the helpless young. One possible redeeming quality about these little warriors is that they may attack dry-wood (aerial) termite colonies in your home. I have observed this Lilliputian massacre in a termite infested table in the Palomar College greenhouse. Most ant colonies are very territorial, and will fight different colonies of the same species. Since Argentine ants in the United States originated from the original colonizers in Louisiana, they are all closely related with very similar DNA. They apparently will accept ants from different colonies as members of their gigantic family. In fact, Argentine ants from different colonies will actually "team up" and attack together in vast swarms. They simply outnumber and overpower their enemy. Argentine ants have become a serious threat to the coast horned lizard (Phrynosoma coronatum) in southern California. The primary food source for these endangered lizards are native harvester ants, particularly the harvester ants (Pogonomyrmex) and (Messor). I spent many years observing this fascinating red ant while growing up in San Gabriel Valley, and I can personally testify that it has a painful sting. 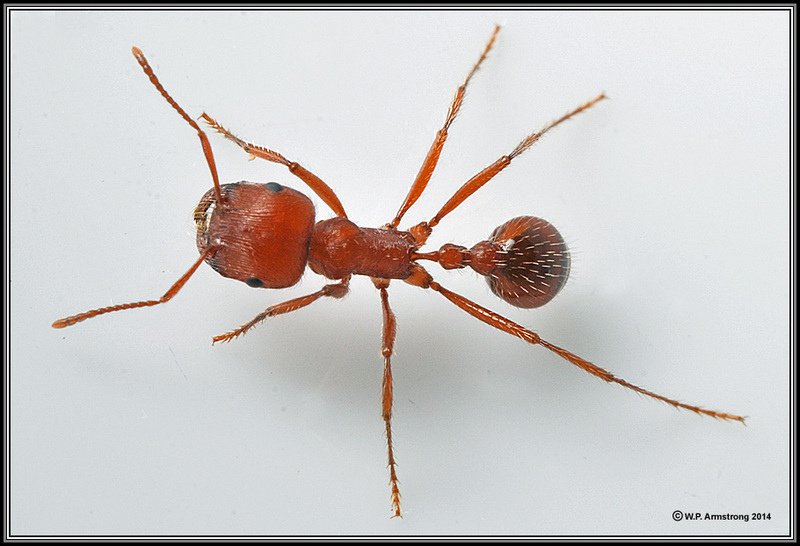 As of 2006, this large red ant is seldom seen in urbanized areas of coastal southern California. California harvester ant (Pogonomyrmex subnitidus), important diet of coast horned lizard. Harvester ant (Messor andrei), important diet of coast horned lizard. 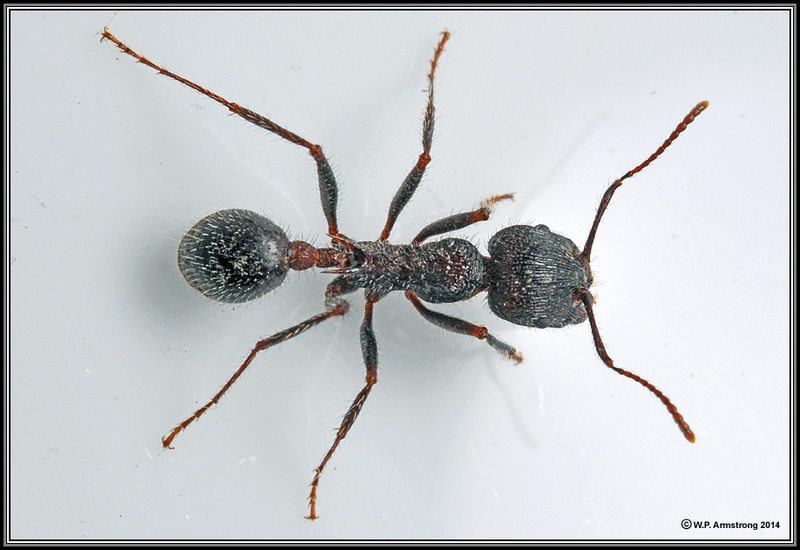 Urbanization has certainly been a factor in the demise of California harvester ants, but an even greater factor resulting in the elimination of native ants and coast horned lizards is the aggressive Argentine ant. 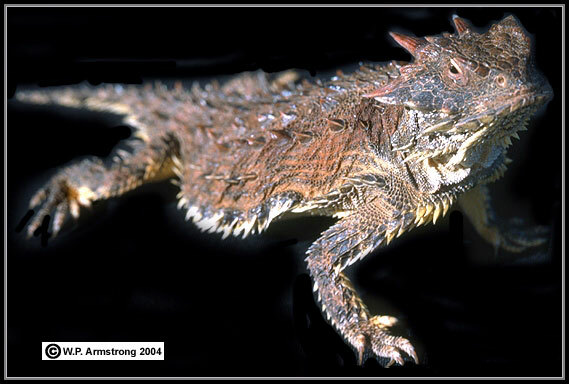 Apparently the horned lizard is not fond of Argentine ants, and is actually attacked by them in enormous swarms. Colonies of Argentine ants need a damp area to survive, and have not invaded some of the dry habitats where native harvester ants and desert horned lizards (P. platyrhinos) still live. Of course, they can readily colonize urbanized desert areas inhabited by people. Well-watered gardens with stepping stones and concrete slabs provide the idea living requirements for these ants. In their native Argentina they live under rocks. 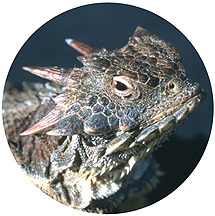 Coast horned lizard (Phrynosoma coronatum). Argentine ants are a terrible nuisance in gardens and orchards because they tend and protect scale insects and aphids. They even carry aphids to the tender buds of your prized roses. In return, the ants consume a sweet secretion from the aphids called "honeydew." In addition, swarms of these ants will invade orchard trees, destroying the fruit crop. 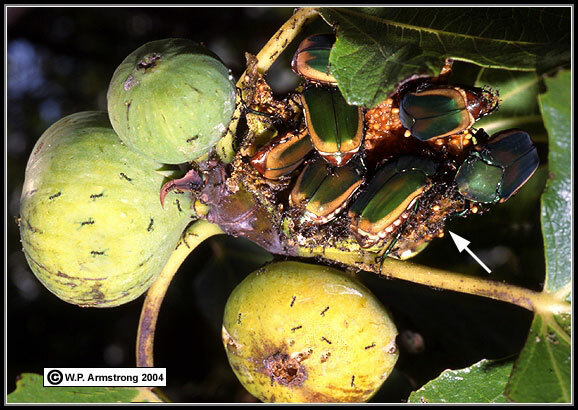 This is especially serious in figs (Ficus carica) where the symbiotic pollinator wasps are destroyed. Metallic green fig beetles (Cotinus texana) gorging themselves inside a fleshy, ripe syconium of the Calimyrna fig (Ficus carica). Although masses of minute, aggressive Argentine ants (Linepithema humile) are also foraging in the syconium (white arrow), the beetles are protected by their tough, impervious exoskeleton. These attractive beetles spend their juvenile larval stage in the ground, often beneath manure piles, compost and haystacks. According to entomologist David Faulkner, if you have a 10 x10 foot (3 x 3 m ) patio slab, you could have a million or more individuals and possibly 20 or 30 queens. They get along fine because they're all related to the original colonizers in Lousiana, perhaps from the original gravid (pregnant) female who arrived there. Workers live a month or more as adults, but queens live up to 10 years or more. With other ants, when the queen dies, the one-queen colony dies because no more ants are being produced. With multi-queen Argentine ants, another queen simply moves in and takes over the role of the deceased queen. In fact, a queen from San Diego would probably be accepted in a colony elsewhere in California. 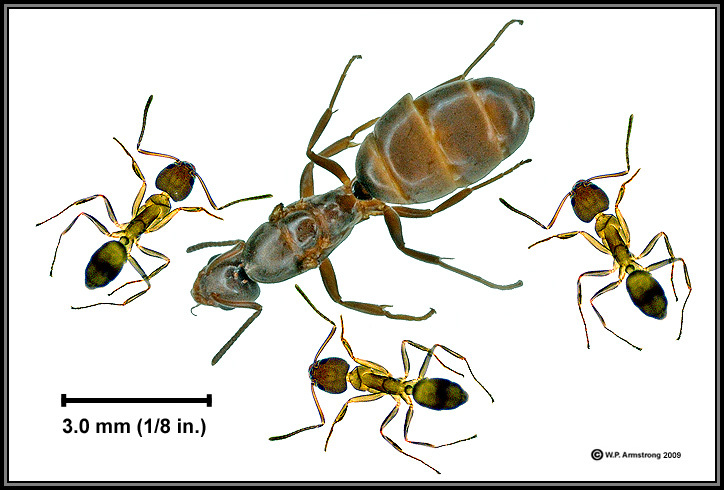 Argentine ants (Linepithema humile): A wingless queen and several workers. Although these ants are only 3 mm long, they are very aggressive and quickly annihilate other ant species, even larger ants with powerful jaws and stings. They overpower other species by their sheer numbers. Argentine ants in the U.S. are descendants of original colonizers that entered Louisiana in the late 1890's, as coffee ships from Brazil unloaded their cargo in New Orleans. U.S. populations are so closely related that different colonies with multiple queens can literally merge together into supercolonies. Image taken with Nikon D-90 and 60mm Micro Nikkor AF-S F/2.8G ED Macro Lens using a Phoenix Ring Flash; hand-held at 640 ISO, F-32, 1/125th sec. I have compared Argentine ants with the "Borg" of Star Trek, a fictional cybernetic race controlled by drones. This is probably not an accurate comparison because the Borg apparently have centralized control by the "Borg Queen." Ant colonies exhibit "swarm intelligence" with the collective behavior of a decentralized system. The individual units (workers & soldiers) are sterile females that operate without a power hierarchy or permanent leader. The queen's role is basically an egg machine to reproduce and perpetuate the colony. The indivuals communicate with each other by the release of pheromones. Extreme warfare in ants arises from a social unity similar to cells in an organism. Cells are recognized as "self" by our immune system because of chemicals imbedded in the cell membranes. Some of these are special proteins (glycoproteins) with unique carbohydrate antennae. Just as foreign bacteria and viruses are recognized as "enemies" by our immune system, ants recognize rival colonies by different pheromones. Simplified diagram of cell membrane structure. This model shows large protein (glycoprotein) molecules embedded in the membrane. Membrane proteins may serve as carriers in which molecules and ions pass through channels in the protein. Glycoproteins may also be associated with cell recognition in which patrolling T-cells and antibodies recognize the shape of membrane proteins as "self" or "foreign." These membrane proteins often contain unique carbohydrate chains (antennae) which are involved in the cell recognition process. In their native homeland of Argentina, different colonies of Argentine ants are not so friendly to each other because their DNA has developed much greater variation. Neighboring colonies may fight each other, even though they are only 200 yards (200 m) apart. Also there are many native predators in Argentina, including fungal parasites and bacteria. The narrow genetic variability that has kept all the California populations on friendly terms may eventually backfire due to excessive inbreeding. Perhaps some day these ants may not have the genetic variability to adapt to a changing environment. How To Control Invasions of Argentine Ants"
Empty your trash often and make sure your house is free of crums and food particles that might attract ants. Make sure that food containers are tightly closed, without residual traces of the food on the sides of containers. These ants can even get into screw-top jars without seals. They follow the spiral threads until they are inside! Avoid using toxic aerosol insecticides inside your home--unless you don't care about your lungs, bone marrow or fish aquaria. For very persistant ants in kitchens and rooms with fish tanks, spray insecticide on paper towel (outside) and carefully rub towel along their ant trails rather than spraying it into the air. Try spraying a deodorant detergent (Pine Sol® or peppermint Castile® soap), Windex® or rubbing alcohol on ant trails in your home. This may erase the scent trail and cause the ants to become confused and disoriented. In my experience, the ants return in a few days. Go on search & destroy missions around your home, spraying an approved insecticide on ant colonies beneath stepping stones and other cool, damp places. Place outdoor ant bait stations such as Terro® along major ant trails in your yard. This is probably better than using insecticidal sprays. Smaller, indoor bait stations are also effective placed along ant trails in your home (out of the reach of children and pets). 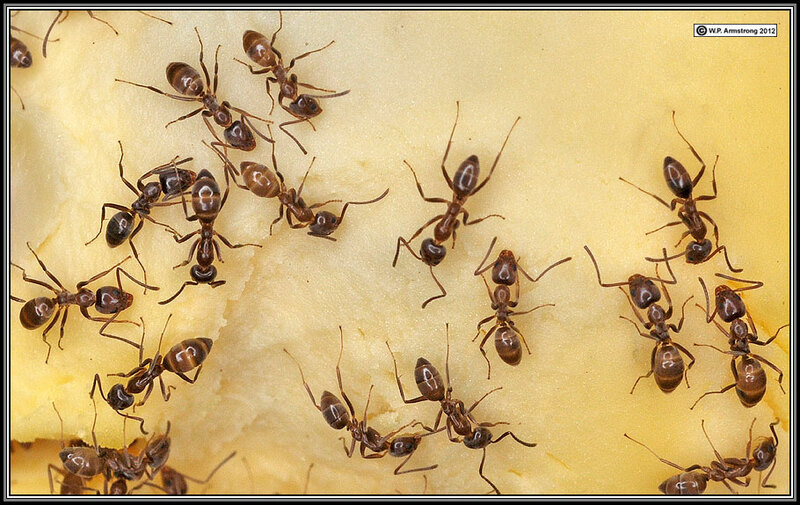 The active ingredients of Terro® is 5.40 percent sodium tetraborate decahydrate (Borax) which is lethal to ants. This salt upsets their digestive system and causes death due to dehydration and starvation. According to Jonathan Hatch ("How to Get Rid of Argentine Ants" ), dehydration and recrystallization of the "boric acic" (borax?) lacerates the digestive system of ants and their larvae. There are many recipes on the Internet that include mixing borax with a sugary solution. Terro bait stations contain this mixture in convenient disposable plastic trays. It is important for the ants to carry the liquid back to their nest. Borax recipes only contain about 5 percent borax so that ants are not killed immediately. One tablespoon of borax in a cup of water is approximately a 5% solution. You must be patient--this treatment may take several days to a week. In fact, you may need to replenish you bait stations! Some websites state that boric acid is a more effective ant insecticide, but this is debatable. Boric acid is made by reacting borax (sodium tetraborate decahydrate) with an inorganic acid, such as hydrochloric acid (HCl). One simple recipe calls for one cup of sugar, one tablespoon of borax and 1/2 cup of water. These values can be doubled for a larger yield. Place mixture in saurcepan and bring to a boil for three minutes. Cool and serve to Argentine ants. Thick syrupy mass can be placed in jar lids so that ants can easily climb over rim. Or, place inside empty soda cans and lay cans on side. 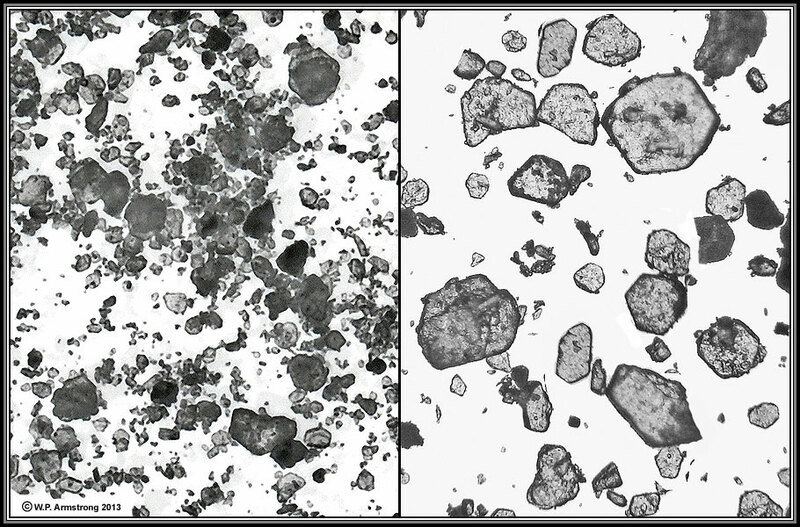 Left: Crystals of borax (sodium tetraborate decahydrate) photographed on black rangetop oven with Nikon SLR and ring flash. Image color was inverted using Adobe Photoshop. Right: Microscopic view of crystals photographed through compound microscope with substage illumination (magnification 100X). Unlike cubical grains of ordinary table salt (NaCl), the crystals vary in shape and size. They are generally polygonal and prismatic with sharp edges and points. 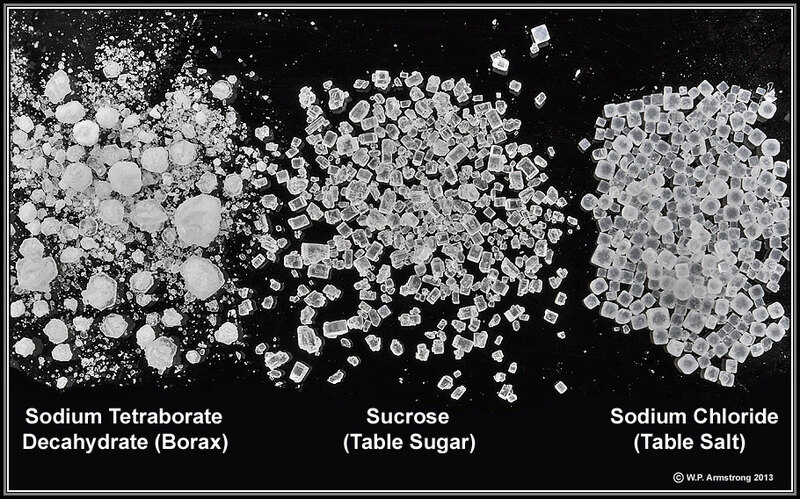 Comparison of the crystals of borax, table sugar (sucrose) and ordinary table salt (NaCl). They devoured the termite colonies inside the rotten legs of a wooden table that was removed from the Palomar College greenhouse. Within days the termites were exterminated. Note: These were dry-wood (aerial) termites, not subterranean termites. Several reports on the Internet (search: Argentine ant + termite) suggest that Argentine ants may be used in the biological control of subterranean termites; however, the effectiveness of this method is still open for discussion. They invaded the nests of paper wasps (Polistes fuscatus) under the eaves of a house, undoubtedly in search of the meaty larvae and pupae. The adult female wasps could not defend against this Lilliputian invasion and were driven away. They invaded the nest of carpenter bees (Xylocopa brasilianorum) in a large redwood log near the Life Sciences building. Again, they were probably attracted to the larvae or pupae within chambers in the wood. The adult female bees were either killed or driven away. They invaded the nest of a mourning dove (Zenaidura macroura) under the eaves of a house. The mother dove was driven away and the young were attacked and killed. Hölldobler, B., and E.O. Wilson. 1990. The Ants. Harvard University Press, Cambridge, Massachusetts. Schilman, P.E. 2011. "Hormigas Argentinas: Exitosas Invasoras de Exportación." Ciencia Hoy 21 (121): 9-15 (Feb.-Mar. 2011). Wild, A. L. 2004. Taxonomy and Distribution of the Argentine Ant, Linepithema humile (Hymenoptera: Formicidae). Annals of the Entomological Society of America 97 (6): 1204-1215. Wild, A. L. 2007. Taxonomic Revision of the Ant Genus Linepithema (Hymenoptera: Formicidae). University of California Publications in Entomology, Volume 126.